CORVALLIS — Something big was about to happen. The Tualatin High School softball team could sense it. The Timberwolves edged closer to the railing inside their dugout, just waiting. 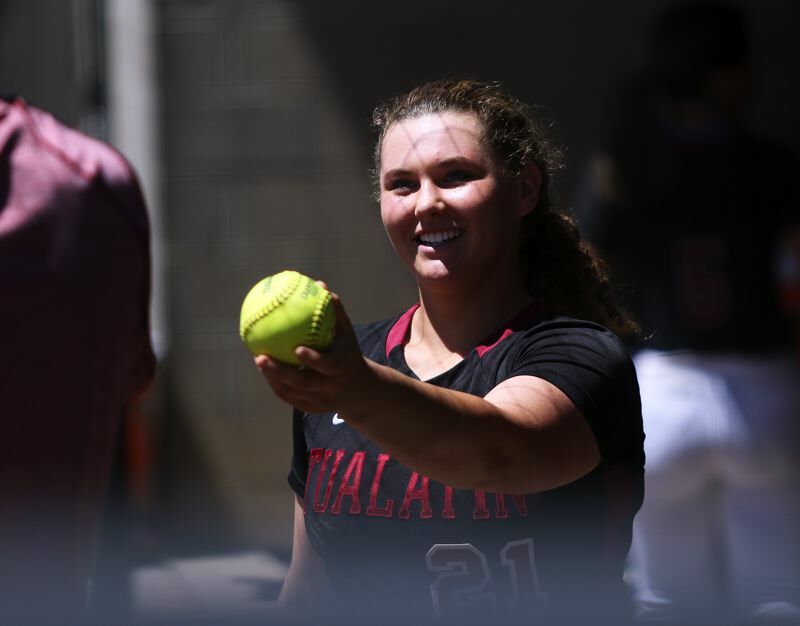 Suddenly, the 3-1 deficit in the Class 6A state championship game turned into a 3-3 tie, thanks, in part to the big bat of Tualatin junior Emily Johansen. Johansen's two-run home run, coming in the bottom of the fifth inning, helped give the Wolves the spark they needed to go on and get a 4-3 win over Clackamas in the state title contest, played Saturday at the Oregon State University Softball Complex. "That felt amazing," Johansen said after the game. "I've had home runs over the season, but that felt amazing." 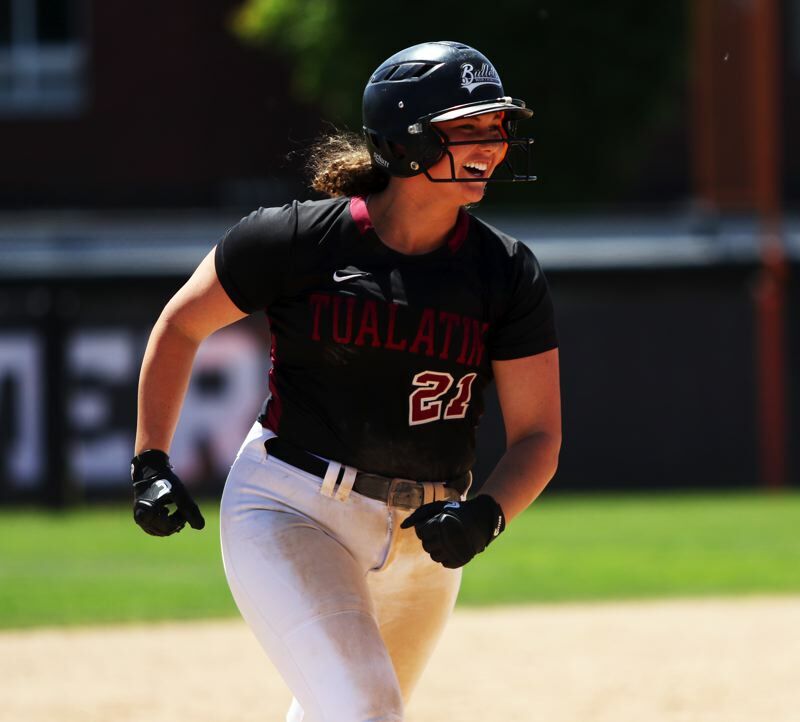 Tualatin senior Ella Hiller, who was on first base when Johansen came to the plate in the bottom of the fifth, was soon running around the bases, jumping high in the air as she rounded second. Like most of Johansen's home runs, this wasn't a shot that just barely cleared the fence, it was a rocket-shot line drive, which left no doubt. And, like Hillier said, the sound of the ball hitting the bat told the story. "Whew, so solid. It was amazing," Tualatin senior pitcher Megan Woodward said of Johansen's home run. "We know she has a big bat, and it's just amazing when it shows up. She's such a stud. It shatters the earth. They could hear that in Eugene." Home runs are nothing new for Johansen this season. The home run she hit in Saturday's championship game was her 16th this year. Prior to this season, the Tualatin career record for home runs was 11, set by former Timberwolf great Holly Ray. And, for Johansen, a left-hander, a good amount of her home runs have come in big games. She hit two — one an opposite-field shot to left field and one she pulled high and way over the fence in right — in a 6-4 win at rival Tigard. She hit a home run in the second-round state playoff win over West Salem. In the quarterfinals against Jesuit, she hit a mammoth blast over the fence in left-center field in the bottom of the first inning. For the rest of the game, three plate appearances, Jesuit coach Jim Speciale decided to intentionally put Johansen on base, instead of pitching to her, including once when there were already runners on first and second with no outs. But maybe none of Johansen's home runs were as special as the one she hit in Saturday's championship game. After getting the ball that cleared the fence, she got a big smile on her face as she handed the ball to her father, Mark Johansen. "He was like, 'if you happen to hit a home run tomorrow, try and keep the ball,' and, so I didn't want to lose the ball," Emily Johansen said. "He's been my coach for, like, eight years, so that was special. He's been there for everything."